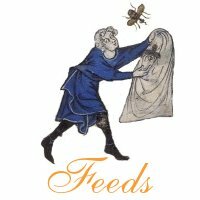 Feeds is our new tiny tool for all RSS-readers interested in topics of digital history. In this project hundreds of RSS sources from digital history blogs is being put into one feed after the appropriate selection (we want to show most interesting news and resources). Using the base of RSS sources and functionality of Google Reader we can show daily at least several interesting news, resources and discussion related to the topics of digital history. Also a special widget with the latest news can be put on the one’s site. Of course all copyrights of the content provided by the project feed belong to the original authors. Feed is only a medium to share information about the sources of the content. We do not even publish it on the project site – it is available by RSS channel (powered by Feedburner) or by the widget (Widgetbox). The mechanism of the aggregation is a part of Google Reader functionality. The database of sources is built by Historia i Media team. Now Feeds channel is available via twitter and Facebook. You can search throught its content using Yahoo Pipes.